EDINBURG — A sign reading “They’re humans, not cargo!” hangs in the shower corridor of a Flying J truck stop in this border city, urging drivers to report human smugglers and to look out for people hiding in truck compartments. The sign is part of Operation Big Rig, an initiative launched by the U.S. Border Patrol in November to combat immigrant smuggling by tractor-trailer drivers. But despite law enforcement efforts to curb the smuggling, cases have increased. According to Joseph Quartarone, a Border Patrol agent who gives presentations to trucking students, 58 trailer smuggling cases have resulted in 971 apprehensions and one death in the Rio Grande Valley during the 2018 fiscal year, which ended in August. That’s up from 45 cases and 600 apprehensions in 2017. Under the new campaign, Border Patrol agents like Quartarone speak to truck driving students, post warning signs about smuggling in truck stops and advise people to call 9-11 if they suspect someone of smuggling. 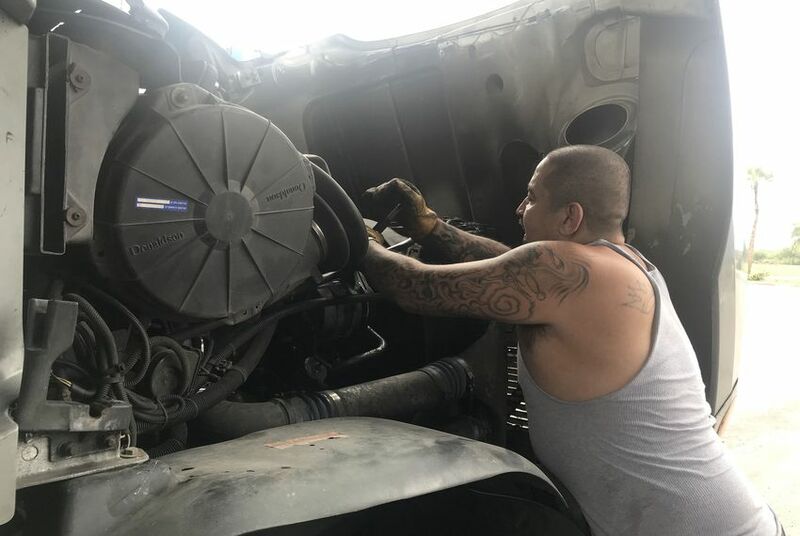 The operation began not long after 10 immigrants died in the back of a tractor-trailer parked at a San Antonio Walmart in July 2017. The driver, 61-year-old James Matthew Bradley Jr., received a life sentence without parole earlier this year. More often, drivers will hide small groups of people in the trailer, or sneak one or two immigrants into smaller spaces in their trucks. But according to Joe Lopez, a truck driving instructor who allowed Quartarone to speak to nine of his students at South Texas College, smugglers have been known to offer up to $50,000, and sometimes more, for a driver to transport a truckload of people. Quartarone said the risks for truckers who smuggle immigrants range from losing their commercial driver’s licenses to a possible 10-year federal prison sentence. Juan Torres, general manager at the Flying J along US 281, a major highway connecting the border to San Antonio and the rest of the country, said smuggling is common at truck stops in the area. In some cases, immigrants are told to sneak onto the truck while the driver sleeps. Torres said truck stops partner with the Border Patrol and will alert law enforcement if they suspect a driver of smuggling. Torres said it’s a good business for the coyotes, using the Spanish word for smugglers, but a risky one for everyone else. Cruz said he’s been approached by immigrants asking for a ride in exchange for thousands of dollars. “I know people that do that stuff, and I tell them, ‘good luck,’” he said, shaking his head.